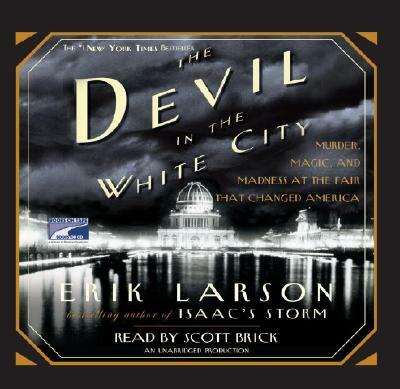 Investigative reporter Erik Larson unearths the lost history of the 1893 World's Fair and of a madman who grimly parodied the fair's achievements. The "White City" was a magical creation constructed upon Chicago's swampy Jackson Park by a roster of architectural stars, including Daniel H. Burnham, Frederick Olmstead, and Louis Sullivan. Drawing 27 million visitors in six months, the fair gathered the era's brightest intellectual lights and launched innovations like Juicy Fruit gum, Cracker Jacks, and the Ferris Wheel. Nearby, Dr. Henry Holmes built "the World's Fair Hotel," a torture palace to which he lured 27 victims, mostly young women. While the fair ushered in a new epoch in American history, Holmes marked the emergence of the serial killer, who thrived on the forces transforming the country. Erik Larson lives in Seattle with his wife, three daughters, a Chinese fighting fish, a dwarf hamster, and a golden retriever named Molly.